This will be a big toys and collectible experience with 1500 sq.m. of open activity space. 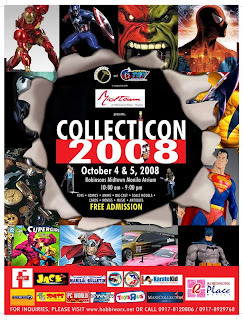 There will be more than 60 booths with toys, comics and other collectible merchandises. Lots of activities, fun and surprises instore. a) Entries must be printed. Please do not submit images on CD or via email. b) Enter up to ( 5 per category ) 8x10 or 8x12 enlargements. c) Your name, address and daytime, contact number should be written clearly at the back of the photo. e) The judges will choose the winning picture based on the following qualities: impact,(25%) lighting (25%), composition(25%), creativity (25%) total of 100 points..
f) 2 categories. Edited and non edited. Please mark your submitted entries at the back. g) Subject any form of toys, figures, cars, statues and robots. Robinsons Midtown Mall ( formerly Manila Midtown Ramada Hotel) is a new wing of Robinsons Place Manila in Ermita. It is strategically located at the heart of romantic and historic City of Manila. Within a kilometer radius is a community of residences, government and business offices, schools and universities, parks, art and cultural centers, hospitals, stretch of curio shops, and night spots. It is within walking distance from Manila's major thoroughfares -- Taft Avenue and Roxas Boulevard. Easiest way is to take LRT and get off at Pedro Gil Station, from there you can take a 3 minute walk towards Roxas Blvd. Jeepneys passing through Taft Ave, Mabini and M.H. Del Pilar are also available, just get off the corner of Pedro Gil st, and take a 3 minute walk. If from the South, from Quirino Ave. right turn at Bocobo st. then straight towards Robinsons. Or Roxas Blvd towards Luneta,take aright at Pedro Gil st. Robinsons is on the left side. You can park at the Basement Parking. Entrance is located at M. Adriatico and Pedro Gil Main entrance ( infront of the drop off area ). Take parking sections E and F which is nearest to the venue entrance. P30 flat rate. Exhibitors can park and drop off their goods at the Main Entrance along Pedro Gil st. which is good until 8:30 am otherwise you have to park at the basement which has entrances at M. Adriatico ( cars, trucks and vans ) or Pedro Gil Basement Parking ( cars and vans only ) take delivery section for freight elevators. Take section E and F ( stairs only ) if you want to be near the venue ( door entrance is just 10 ft. from the activity area.